The ever-increasing standards of No Child Left Behind regulations and various state assessments have put more pressure on teachers and administrators to monitor the learning process. more often to prepare students for high-stakes tests and for districts to understand results for various groups and subgroups, which helps remedial efforts and future students. The Plano (TX) Independent School District currently is on its third iteration of assessment technology and believes the software finally has evolved to provide useful, real-time data to instructors, explains Jim Hirsch, associate superintendent for technology and academic services for the 54,000-student district. “It's made a difference in the day-to-day instruction as it relates to how teachers present the material,” Hirsch says of the SAS Enterprise Intelligence Suite for Education package the district installed got up and running in fall 2005. Jim Hirsch had a central database for assessment information, but it was so cumbersome to use that many principals went back to spreadsheets. The turn of the millennium saw the advent of a proprietary Web-based assessment tool that was an improvement on the previous system but still had no ad hoc reporting feature, which meant that Hirsch's staff built more than 600 specialized reports. Reports also were difficult to print. The SAS product allows teachers to examine student performance that year, not the following year. Robust ad hoc reporting and printing options make the system easy to use, and it interfaces well with demographic reporting tools, which helps teachers and administrators parse data many different ways. Parents and guardians can log on to the parent portal to access the history of a child’s learning, expected achievement growth, and where a child stands against the norm. Data include cognitive measures, Texas Assessment of Knowledge and Skills (TAKS) scores, and other individual reports. “We’ve gotten excellent feedback from parents,” Hirsch says. However, the district learned an important lesson during implementation: Fortune 100 companies like those SAS usually works with may not have as many simultaneous users as a district with 34,000 families. The district had early slowdowns on the system due to the number of simultaneous users but worked with the vendor to create what Hirsch calls a bulletproof solution. In a three-month head-to-head pilot program between eInstruction and Promethean products, officials at the Enterprise Elementary School District chose eInstruction, pointing to ease of use and price as determining factors. Representatives from each company demonstrated products, then left them for the trial period so teachers could compare the products side by side at their own pace, using their own material. The initial purchase of 24 systems will be installed by March and includes eInstruction’s Classroom Performance System and the new Interwrite Mobi tablets. Over a three-year period, Wolfe says the technology will be in each of the district’s 250 classrooms, allowing teachers to give quizzes on the white board that can be tallied electronically for instant feedback on whether pupils have mastered the material. Teachers also can post questions on the fly to get feedback during instruction time. “Promethean was more of a package price, while we can grow with the eInstruction product,” Wolfe says. “Our decision was based on price, performance, and how well it integrated with our PowerSchool student information system.” Wolfe notes that the price was about half of the competing product. Bringing assessment results as close to teachers as possible is the goal of the Evanston/Skokie (IL) School District 65 administration and teachers, which has brought new thinking about how assessments are administered and reported. When CIO Paul Brinson arrived at the 17-site, 6,500 pupil K-8 district, assessments were done with pen and pencil tests that were scanned and compiled, but not in a systematic fashion. 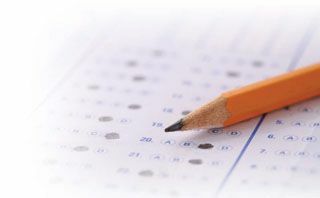 Beginning in 2004, District 65 teachers created their own tests, with information services scoring and reporting the results using Infoline software. Pupils in grades 6-8 now are using the Measure of Academic Progress (MAP) assessment from the Northwest Evaluation Association that’s aligned to Illinois standards. “The MAP test is adaptive, and different items may be presented to the student, depending on an individual student’s responses to previous items,” says Brinson. Paul Brinson 3-8 to use the MAP assessment in the 2009-10 school year. Reading is a primary focus in grades K-2, and teachers use Palm Pilots to administer the Illinois Snapshots of Early Literacy (ISEL) assessments. Data are synched with reporting software for report aggregation. Following the implementation of the School Information Systems’ SIS K-12 student information system from Tyler Technologies this summer, Brinson hopes to create dashboards for teachers that show individual students or groups of students’ results. The dashboards will show Illinois Standards Achievement Test (ISAT) scores, along with information from MAP and ISEL assessments, and other informal sources such as Promethean Activevote tallies to create more accurate snapshots of pupil achievement. “This ties directly to our (response-to-intervention) initiative that uses data for decision-making and monitoring and to look at students’ progress over time,” Brinson says. The combination of assessments and reporting not only allows parents to have a more accurate picture of how their children are achieving, it also gives teachers summative information sooner on current or incoming students to customize learning for low and high achievers alike.